Auntie Mary on the left and Mom on the right. Auntie Mary was four years younger and they celebrated their birthdays together every year since they were only a few days apart. "I miss her" she says....without fail. I believe her and know those words have been thought much more often than only on the days she sees me. Those sisters have not seen each other for seventeen years. Auntie Mary celebrated another birthday this last week. My Mom...would have turned 90 today. her life has only begun. Eternity is not something we can fathom. Everything we know begins and ends. Mom was wise to place her trust is something greater than her own knowledge. She was a big fan of the Haven of Rest radio broadcast. Bible open and pen and notebook near by. I opened up her Haven of Rest song book today and looked at the theme song I often heard. Chorus...."I've anchored my soul in the haven of rest. I'll sail the wide seas no more. The tempest may sweep o'er the wild, stormy deep. In Jesus I'm safe ever more." To save by His power divine. And say, "My beloved is mine" . Haven of Rest is now called Haven Today can be found here. Such a sweet photo of them both as they squint into the sun. It's impossible to not miss those who have gone before. I used to think that one "got over it." I know that's ridiculous now. What a sweet story about the Haven of Rest program, which I have never heard of, but am certain that I would've liked very much. Does it still play or has it gone the way of so many others? Thanks Deanna...I found it and will add it to the post. I knew right away which one was your sweet mother! Have a wonderful day as you live her legacy - a faithful Christian mother who passed her faith down to her children (and through them grandchildren and great grands). What a beautiful thing! I love that photo! Sisters are so special. I can't believe your mom would have been 90! But, I think you are the youngest in your family? Haven of Rest -- the theme song can pop into my head at moment's notice. We grew up with Moody radio on constantly when we were not schooling. What a beautiful vintage picture of your mom and her sister! I love what Deanna said about you living out her legacy and remembering her today. She would be so very proud of you...as you continue living a faithful Christian life! Hugs to you today. I remember my Mom listening to the same program every morning - "Eight bells & all's well" pops into my head when I hear "Haven of Rest". Wonderful post and precious photo. May her memory warm your heart today. Seems the apple didn't fall far from the tree. Blessings to you! Our moms are such an example of a simple faith - secure for eternity. It's true what you said about how everything we know begins and ends. It's hard to fathom it otherwise, but the peace exemplified to us is really all we need. I know your mom would give you a sweet smile and loving hug for remembering her like you do today. That song gave me a lump in my throat! How wonderful to know that our moms are together today with their/our Saviour. And how special that they shared a birthday! What a great sister photo. I love their coats! I don't think I have ever seen that picture of my two aunts! It is a very nice photo! and yes.. I miss your Mom too! Haven of Rest? WOW ... few things trigger childhood memories like the theme song of Haven of Rest... as Judy said... lump in my throat! Happy birthday in heaven to your Mom, Lovella! I love the photo of her and her sister. My Mom would have been 90 this summer. I miss her so much! We had planned an early surprise celebration during my daughter's wedding weekend as everyone was going t be in NY for the occasion. I'm sorry she didn't get to attend both, but I know she's at peace in heaven as she was well prepared for eternity. Hugs to you today dear friend. I understand the void in your heart today. How lovely, Lovella! 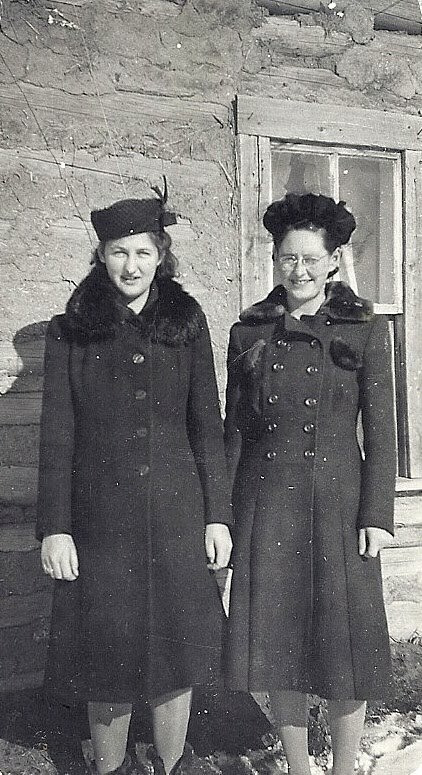 Those young sisters, your mother and aunt, are so fashionable and sweet. So interesting that your mother and Judy's mother shared a birthday. I can just imagine their delight, together, in your accomplishments! Such well dressed women! I noticed the crude by today's standards house behind them and thought how people today live in elegant houses yet often dress crudely. Do you know if that homestead is still standing? What a sweet tribute to two special ladies in your life. Two ladies who made such a huge impact on who you are now. I felt love and admiration in every word you wrote. My mother always listens to "Haven Today". She goes to sleep every night with it on her bedside radio. We grow up with it and I loved reading that you did too. As I read the words to the song that you shared, a thousand memories came flooding back. What a wonderful post! You stated it all so well. On Feb. 8th was my mother's birthday, and as I read about your mother's and Judy's mother's birthdays, it made me appreciate that my mother is still here. This was such a special post and it brought tears to my eyes. What a sweet picture! How lovely that you still have your auntie with you. You can share those memories together. All my mom and dad's siblings have passed away. It feels strange, and a little sad, as there is no one left from that generation. I had forgotten about that radio show. I'm going to check it out.